Powder painting is the process of coating a surface in which a powder material is applied using an electrostatic or compressed air method. The applied powder is then heated (cured) to its melting point, after which it flows to form a smooth film which dries to a firm, durable finish very resistent to scratches, cracking, peeling, UV rays and rust. - CLEANING - the process of removing of all organic and inorganic soils from the product to be coated. Cleaning is normally completed by media blasting and/or in an industrial washer combining heat and high pressure. Powder coating's strong resistance to extreme temperature, chemicals, UV rays, abrasion, cracking or chipping has made it a popular finish with automotive and motorcycle parts as well as outdoor furniture and exercise equipment. Powder coating is also an excellent choice for refinishing and restoration projects . ZRM SLAWMONT offers the fastest growing, finishing technology for steel and aluminium components. Its profound rate is due to its economic and environmental advantages over liquid paint and at the same time providing a superior finish..
We attach very much importance to the proper lead up of components prior to the very coating process as it significantly improve the surface for powder adherence. The technology we use along with an experience we gained quarantees the highest quality of the painted surface. Accordingly to the needs, we use a wide range of types and colors of powder: Epoxy ,Polyester ,Hybrids from a top tier producers, like: Jotun, Herberts, Pulverit. Available resins can provide the combination of characteristics you need. 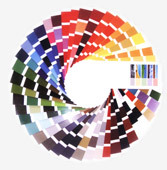 We offer powder painting in full range of colors, based on the RAL pallet.